Mama owned an answering service and worked a switchboard under a beehive of red hair that matched her bright lipstick. She had no eyebrows, so she penciled dark, wide arcs over her large, dollar-bill green eyes. 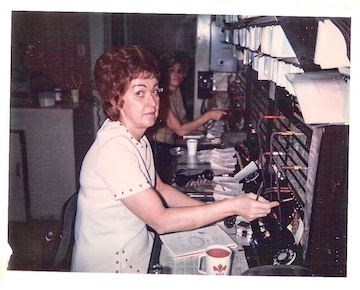 She named the switchboard Board One, because it held her most devoted customers—the ones who followed her from another telephone exchange as she finagled her way out of a fiasco and into her own business. I spent most of my twenties working for my mother. I’d take off now and then for the Rocky Mountains or the Pacific Northwest. But after a few months, I’d return to South Louisiana and slap on a headset and plug into one of her ten switchboards. It was the best job I ever had. Not only did I get a paycheck every two weeks, I amassed a PhD’s worth of education in human nature. Every day I observed Edward Albee-like dramas played out with Cajun and Texan accents. Each switchboard held one-hundred phone lines for big and small oil companies, large trucking conglomerates, and individual hotshot drivers. Some of my favorite characters were a geologist, a veterinarian, and a political lobbyist. 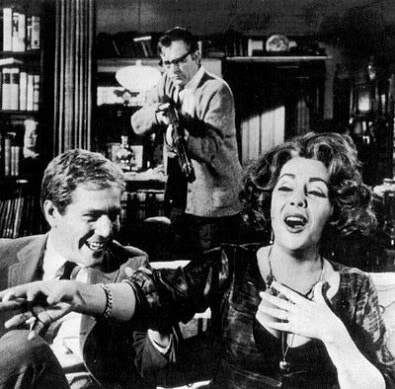 But the most entertaining was a married couple similar to George and Martha in Who’s Afraid of Virginia Woolf? Armed with a headset and a few patch cords, I was able to connect customers to their callers who held on another line. This was before cell phones, so messages piled up while I beeped clients and waited for them to call in, usually from a pay phone. If clients had numerous calls to return, I’d be asked to stay on the line in order to dial up each person on the message list. This saved coins and time. I spoiled my customers by staying with them as Mama and other operators picked up my slack while I sat privy to men and women’s private lives. I’m still amazed people would allow me to listen to their most intimate conversations. The person they called did not know I eavesdropped and spoke freely. But my clients knew I was there and trusted me with their wildest shenanigans. The only time I had to say no to the practice of listening was during checkout time. Every plug on ten switchboards would be crossed and stretched in artful webs. The women beside me had no time to reach over and answer my phone lines while their boards exploded in a frenzy of buzzing and light. Arms flew and mouths yammered for two hours straight as operators noted the whereabouts of service personnel, another eye-opening aspect of the job. For instance, the couple I alluded to earlier as George and Martha kept me on high alert. George would check in to tell me he’d be at his girlfriend’s apartment as Martha, his wife, would call with her own secret whereabouts. At the end of the evening, those two would collide at their residence rip-roaring drunk. George would phone in to slur that he was home and I could hear Martha spouting obscenities in the background. One evening, I realized they’d both checked in to the same hotel with insignificant others. In a panic I told Mama the situation. Without hesitation she sent an operator to drive by the hotel to ensure George and Martha’s rooms stood far apart so the married couple wouldn’t spot one another at an ice machine or stumbling across the parking lot. Fortunately, their rooms rumbled at opposite sides of the Holiday Inn. That kind of quick thinking made my mother a great operator. I was good but not the best. Like Mama, I learned to recognize voices even in the clearing of a throat. Before callers could finish saying their names, I’d spin a wheel on top of my switchboard and pull out a 3×5-inch notebook to record customers’ itineraries—tiny journals of their lives. It’s no wonder I’m compelled to write nonfiction, even though I set out to write fiction. Perhaps I’ve just heard too many true stories and observed a cast of characters that entertained me so thoroughly I’ve no need to make up things. For a decade, I jotted down details and worked as a keeper of marvelous secrets and fabulous lies. It’s been twenty-five years since I plugged into other people’s dramas. Since then I’ve sporadically attended the local university. Mostly I’ve learned the craft of writing by reading and studying on my own. Looking back, I now know that it was my job at Mama’s answering service that provided the best education for writing memoir. If you’d like to read more essays by writers about day jobs, I highly recommend “Fear,” which originally appeared in The Three Penny Review by Charlie Haas, author of the wonderful and quirky novel, The Enthusiast. Also, check out Sonny Brewer’s collection of essays by authors such as Howard Bahr, Larry Brown, Rick Bragg, Pat Conroy, Tom Franklin, Connie May Fowler, John Grisham, Tim Gautreaux, Silas House, and many more of my favorite writers titled Don’t Quit Your Day Job: Acclaimed Authors and the Day Jobs They Quit.